We have a great global network of people who own and deliver our Lost Dutchman teambuilding exercise as well as tens of thousands of managers and leaders who have been through the game and understand what the basic themes and anchors represent. If you want to see a bit more about Servant Leadership and links to the exercise, read on, and apologies if some aspects of this do not make sense, since our primary audience are those experienced with the simulation. This post is about how we are altering the basic design to better link to servant leadership development and organizational cultural change. The goal of this post is to share some of the thinking we are doing around the simple reframing of the simulation to mesh better with implementing Servant Leadership / Selfless Leadership behaviors. The theme is about involving and engaging people to optimize everything! Our focus is on breaking the old “command and control” leadership model and causing real reflection and change in leadership behavior. The Lost Dutchman game models seamless game facilitation behaviors and allows us to discuss game behaviors in the context of workplace collaboration and the optimization of results. This careful reframing of the basic Dutchman delivery will focus on meshing selfless leadership into team building training to generate real changes, to help leaders really understand the impacts of their behavior and choices on improving the performance of their people. I will share some ideas and thoughts about using the Lost Dutchman game in a slightly different delivery mode, adding more collaboration, integrating delivery around the SL model more clearly, and providing ideas for better implementation of desired behaviors. This latter thought is obviously the most difficult; People will TALK about doing SL kinds of things, but then revert back to their regular behavior, the normal command and control model, if people let them. The idea is to build in more followup after the session to better install these behaviors into the culture. Honesty when mistakes are made. Staying focused on tough issues while avoiding drama. Finishing. Notice when someone reaches a goal or completes a task. Positivity. When someone energizes others, notice it. Reaching high. The pursuit of excellence inspires. Taking action without being told. Positive impact. Notice how one person’s actions impact other people. Transparency. Be grateful when someone reveals their heart. Imagine that workplace! How would it feel to be working amongst people with those shared values and behaviors. How might it impact your personal growth and development if you really felt that the manager and the organization really cared for you? How might that workplace perform of you and teamwork among the people? And note that there is a ripple effect of a leader demonstrating such behaviors. It can be a kind of pay-it-forward impact, generating a broader spread of such desired behaviors and allowing positive behaviors to pass through and making the workplace a better workplace. So, how to we get there from here? The Introduction to the LDGM exercise is easily modified to add SL themes and ideas. Plus there are ways to alter the workshop design, in general from a pre-workshop and post-workshop perspective. Colleague Scott Knutson has been using a pre-course reading assignment about SL and key leadership behaviors that can be seen within his organization. The idea is to make these basic themes clear and understandable. He and I will write more on this and share some specific ideas in a later blog. Scott also posts “posters” on these key themes around the room as reminders. And, we are altering the actual Introduction itself to carry some of these ideas; that is a work in progress. The basic idea is to minimize surprise and to prompt players to consider using these themes in their play of the exercise. My suggestion is that we also use the Assay Office Version of The Mine Video within the play. I explain this change to the basic strategic planning metaphor in a blog. The initial idea was a “high profitability” version of play but the adding of an extra ounce of gold availability when mining if tabletops improve their sharing of information and resources is a powerful addition to the play of this LDGM-SL version. The teams can choose to collaborate and we can measure and show that choice in our debriefing. Since we make all these SL themes and possibilities for choice available to the players, it is very interesting that most simply choose to do the more normal kinds of competitive behaviors, working well with their own tabletops but not collaborating effectively with the others. The competition is measurably shown to sub-optimize results in the debriefing, also. Dutchman does a wonderful job of generating those behavior gaps and causing really solid discussions about what they should be doing differently to improve their actual leadership performance and results. And using this Assay Office framework simply makes these gaps even more evident. The impacts of improving collaboration and having more of those selfless behaviors noted by Dan (above) show themselves clearly as performance improvement opportunities. The elegance of LDGM is how cleanly we measure results and the optimizing impacts collaboration and resource sharing can have; it seems pretty unique to our design. What other changes are possible in the normal design of LDGM that can add to the SL model? The exercise is designed as, “twenty days of two minutes each.” That sets up play as roughly a 40 minutes of delivery time. But the reality is that the last 6 days are simply spent returning to home – there is no challenge and the last 10 minutes are simply an ending of play. So, the question was about optimizing the discussion and minimizing wasted time. The answer was a third Arctic Blast! Given the overall design and the “limited but sufficient resources” that we give to tabletops, a third Arctic Blast would generally kill off all the teams. THAT would certainly stop play, right? So, if we showed that third Blast, we could then stop the game. We could also very accurately project final results of all teams and the group overall, showing them how things would end if they kept doing what they were doing. So, why not end the game, show them how they would have done and then use that time to reframe their choices, change their competition to collaboration, share the information available and redistribute resources so that results were optimized and so they could see the actual impacts of more of the SL behaviors on the group, culturally and measurably. At this point, we will help the players “do the numbers,” giving them coaching and the job aids needed to help them calculate new results based on the changes they can make. We can ask them the questions necessary to alter their culture. How many tabletops have the $30 Spare Tires and could use more Supplies and Fuel ($20 and $20, respectively)? How many Cave Cards will not be used and that can be shared? How many Turbochargers are not being used? Which teams do not have Turbos? How much more Gold can be mined if more teams had more resources? Given that Rule Number One of the Expedition Leader is that, “they are always right,” what do you need them to do to assist you in generating improved results? Lastly, we are designing activities to followup on these key themes and the choices and commitments that the individual players will make about what they will try to do differently after the workshop. There are any number of design features for improving followup using our Gold Cards, twitter hashtags, etc. Designing small implementation work teams as part of the debriefing and post-workshop planning for culture change is pretty straightforward. There are a variety of things that individuals can do to earn their White Hats. One of the world’s very best teambuilding simulations just got better. And we guarantee satisfaction. We know that this exercise, focused on collaboration between teams and themes of leadership, motivation and alignment, is outstanding. Surveys of our customer users — primarily senior trainers in large corporations plus a network of independent consultants globally – continue to confirm its effectiveness for building teamwork and inter-organizational collaboration (see survey results summary here). From their view, The Search for The Lost Dutchman’s Gold Mine is a premier, polished and respected team building simulation, now in its 25th year of global distribution. The real impacts come from the Debriefing slideshows and the effectiveness of the images and metaphors for engaging people in the debriefing. The idea is to add more color and context to the tabletop discussions and to the group summaries about perceived issues and opportunities. The images will also allow us to share Workplace Improvement Posters and other ancillary materials to reinforce key learning points in workplaces, something we can customize with our customers. The use of Lego in both Dutchman and Square Wheels allow an easy sharing of ideas and metaphors between the two concepts making these tools integrate better and allowing for easy links to other content and information. While we are not using any LEGO® in the actual play of the game or on the tabletops in our deliveries, it certainly adds that possibility to the play for our customers, especially if they are integrating with LEGO® Serious Play® kinds of tools or using our Square Wheels tools within their workshops. Nearly every training file of each version of Dutchman (LD Pro, LD-6, LD-4, LD-3) has been rewritten and updated and folders reorganized to improve the learning process. Reports are that the materials themselves are bombproof. Understand that a unique quality of Dutchman and other PMC products is that none of them require certification nor support fees nor licenses. Most users simply buy the materials, work through the training and start delivering their programs with little or no need to contact us. NONE is required! If you want to see more about these materials, we uploaded a Slideshare Overview of about 30 slides. • The benefits of updating are simple: You get a better game! • The benefits of purchasing are simple: You get a great exercise at a one-time cost with no licensing or certification or annual fees and you always get the direct support of me, the game’s designer. if you are a current owner and you want to update what you have or get a larger version, we will give you full credit for the smaller game you own toward the purchase of a version to handle more participants. (this is a limited time offer, expiring on December 1, 2017.) Please contact us for details. Pay $125 for Pro; $75 for LD-6; $60 for LD-4 and $45 for LD-3 updated files. Going to the Dutchman Facebook Page, “Friend” us there and “Like” the page. Once you have completed either #1 or #2, above, we’ll send you the new upgrades, electronically, for your specific version, it’s that simple! Let’s hear a YEEE HA! More than 20 years of working with organizational performance improvement and team building and experiential learning has taught me a few things, I think. So, I wanted to share some reflections around how to optimize the impacts on individual and group learning. There has always been a discussion in the experiential learning literature about the need for focused debriefing versus the inherent learning that naturally occurs. After all, how much time needs to be spent talking about the obvious? One might think that the experience itself would be sufficient for learning to occur and that no debriefing is necessary since the key learning points are all so obvious. The other perspective is that a focused discussion and reflection are paramount for learning to occur. Overall, I think that the key is BALANCE. Key learning points should be discussed, with the reality that some people will learn more than others and that individuals within a group will each see different things, depending on their perspectives and experiences. But spending too much time in too much detail will dull the brain and cause a loss of interest and engagement. (or at least differently than before!). Learning can occur within an individual simply as a result of some experience. But I also think that reflection and discussion generate much richer learning. As an example, let me use my Square Wheels® illustration as an example. One person looking at the illustration may come up with 2 or 3 insights as to possible meanings, where another might find 10 to 15 learning points. Commonly, a group of people feeding off each others’ ideas and comments can readily identify 30 or more key points. And, they will have more fun doing it. So, reflection and some discussion DO generate a richer learning environment and one that is more likely to generate some impetus for change. My personal belief is that an exercise like Lost Dutchman is an excuse to do the debriefing and that the exercise is merely the platform for the group learning that will occur. The authors of “The Annual Handbook for Group Facilitators” (Pfieffer and Jones, 1983) felt that it was “axiomatic” that the processing of the experiential learning program “are even more important than the experiencing phase”. These authors even urged facilitators to take care that the activity “does not generate excess data”. Rappelling a mountainside or descending whitewater in a raft with 5 others would be the kind of experiences which would “generate excess data.” Too much, in fact, to capture and categorize, and not much real learning would occur. Experiential exercises offer the benefit of links to preferred information gathering and decision-making styles. It can match with the kinesthetic, visual and auditory learning styles and confirming systems. The various roles can also benefit when a team applies the different thinking styles to the information processing and risk-taking situations. So, one of the benefits of an exercise like Lost Dutchman is the clean design and straightforward metaphors that allow for a relatively structured debriefing of individual and group experiences. In all of our game designs, we pay attention to business issues and opportunities and thus structure our suggested debriefing approach to allow groups to focus on realities of the workplace as well as the applications for the future. The themes and relevance are designed to be obvious. At the same time, shared experiences also allow the facilitator to link the program to their existing and preferred tools. Should someone be using DISC, for example, they might use the game at the start as a tool to set the stage for a discussion of possible styles or at the end to test out applications of others preferred styles toward themes of teamwork and problem solving. If people are focused on strategy implementation, they can use the issues about confusion regarding the overall goals of the exercise – “to mine as much gold as we can” in the case of Dutchman — to discuss the reality that choosing to compete will sub-optimize overall group results, the main cause of why “interdepartmental collaboration” is an oxymoron in most organizations. The game experience helps link the choice in the game to the reality of workplace choices, helping to define what could be done differently. By taking the time to debrief the program, you gain the benefit of group perspective and individual learning. What you got from the game is thus less likely to be lost among the informational noise and data. And a team focused on how they handled risk, for example, will most certainly generate different insights than simple reflection by an individual; the nature of the discussion and the different viewpoints will allow more objectivity and perspective. 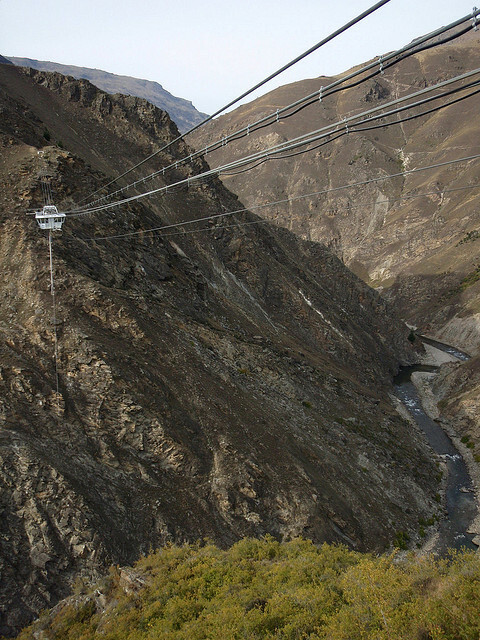 Years ago, I jumped a 130-meter bungee jump in New Zealand, the Nevis. It was risk-taking in some ways. But a failure to debrief on decision making and perceptions of safety and other issues did not occur and there was not a lot of learning that occurred, in reality. I see this same kind of thing in the actual learning from a lot of different outdoor adventure activities – learning will come from the debriefing and reflection and not simply from the experience itself. It is when the activity and its review are combined, facilitated and discussed among teams that the real benefit of the event occurs – the learning that occurs with possibilities for personal and social development. Future-pacing possible outcomes is also beneficial. The challenge is to discover ways of merging these learning elements into real individual and organizational improvement. In the short term, a single element may dominate the experience, but ultimately this dynamic form of learning depends on the harnessing and intermixing of these many elements and learning that come from reflection and discussion. 1 – Continue to publish articles with ideas to improve organizational performance and link to issues of corporate team building opportunities like this blog post. 2 – Go back and add the category, Dutchman Delivery Tips, to the relevant previous posts in this blog to improve the sorting of these particular articles. You can now search that Category for ideas about improving the link of team building simulations like LDGM to your development frameworks. Most often, people just purchase the Dutchman team building exercise and play it with their group. It is pretty bombproof and users see that it goes really well without understanding the thinking under the design and those little things that make everything pretty congruent.They get a good outcome and they are then satisfied with the way things work and are not looking for different ways to play. It is surprising how seldom we get into dialogs and interchanges about other features of the design, however, even though many options are detailed in our Professional Edition of the exercise or appear in different posts of mine. And the reality is that there are any number of different nuances that can be integrated into a program to improve its connection to desired outcomes. One: I had forgotten ALL the cards for a program up in Gaffney. SC and had an hour over lunch between the morning Square Wheels and the afternoon Dutchman delivery. Immediate panic. The creative solution to that problem became the Inventory Management Delivery Option, where I gave teams their starting inventory and we simply kept track of consumption on an inventory form (me at the Trading Post and the Supply Expert at each tabletop). That was a really really excellent question, causing me to rethink the overall design… It is awesome that questions become new ideas. What I did was to repack The Mine Video to have 16 Cave Cards (instead of 12) and I changed the instructions to tell players that by using a Cave Card, they could mine 11 ounces of gold each day. The extra Caves I include can be shared freely with other teams and each one used would generate an extra ounce of gold. We call this The Assay Office Version, since the Trader can report to another person (at The Assay Office) to track the gold mined over the days (leaving the Provisioner to simply bank the game). You can purchase this complete tool, with instructions and delivery options, at this location on our website. It is about optimizing overall profitability and it adds another collaboration element to the play and discussion. You can actually see when the collaboration between the teams starts and you can count the unused Cave Cards and you can add the number of extra ounces produced by the planning — getting the Mine Video. Each unused Cave Card loses $250 in results. Measurement of results adds more impact in your debriefing and linking back to the reality of the workplace! None of this appears in the LD3, 4 and 6 games but this and more is in the Pro Version (but not mentioned directly in the Rental stuff, simply because it is too nuanced for a single use in a large group… But these kinds of enhancements can be integrated into all the LDGM game deliveries. The Search for The Lost Dutchman’s Gold Mine (LDGM) is a powerful team building simulation that we have been running since 1993. And the initial thoughts on designing the operational side of the game was to make it very simple to deliver, with the idea that the exercise could be run by senior executives. My goal was to put forward some ideas that can be used with any large group event where involving the senior manager team would be useful for the visibility and for their collaboration. But, I did frame this blog up around my flagship team building game. The ideas should stand on their own, however. Since we rolled it out, it is great to get the stories about successes in such frameworks, since the impacts of the senior managers leading the play and the debriefing would obviously be much more effective in sending messages than if outside consultants or people in training were running the program. Plus, with the simple design, we could also run very large groups, seamlessly, making the exercise ideal for big group events of 100 or more participants. First of all, Dutchman is one of the truly great team building exercises that works well with really large groups. My largest session was 600 people, but a software company in India holds the record with 870 people in one room at one time, with a solid debriefing linked to their specific issues and opportunities. Generating real organizational change or aligning people to the new company strategy is always an issue – how does one generate real involvement and alignment and ownership among the senior management team and then among all of the key performers? I think that active involvement and engagement and understanding along with clear discussions about past and future choices for changes and behaviors is what generates impact and value. Senior managers like to respond to challenges, and what better challenge than having them learn to facilitate a program that generates alignment of their own people toward the organization’s goals and objectives. Senior managers will often talk team, but they operate their own groups in a way to isolate them from real inter-organizational collaboration. We hear the term “silo” enough to know that it represents real organizational reality. So putting them into a situation where their teamwork together is required for effectiveness makes it easier to get these behaviors down the road. Working as a team generates teamwork, especially when there is followup and discussion about the impacts. Instead of some unknown people running around during a facilitated event, why not have these managers walking the talk and supporting teamwork and sharing resources and behaving congruently? We get the managers aligned and congruent with the above as part of the game and as part of the debriefing on what changes need to be made to impact and optimize organizational results. Dutchman has had 20+ years of polishing to make it into a very straightforward team building program where there are few hidden tricks. It allows for the complete congruence of all of the facilitating staff to support the players in solving the planning and execution challenges we present. The banking of the game and the tracking of team behaviors was also designed to be really simple and clearly understood in the debriefing. There are no “mechanical” issues or illogical demands and it is easy to learn how to operate the game. The goal was to enable a facilitator to pay more attention to the observed behaviors rather than needing to become some expert on game mechanics and unnecessary complexities. When I first started my deliveries, I would assemble some people and pay them for a few hours of their time to help me deliver large games (50 people or more). Smaller games, I can operate by myself. As I was asked to deliver even larger events, I would generally get internal people together for an hour or so to teach them the mechanics — these were often the training or HR staff who were supporting the event. But I eventually discovered that involving the senior managers in the delivery gave me the biggest impacts. Now, for a large session of 200 or more, I first deliver a real team building event for the most senior managers, running them through the actual exercise with a short debriefing of results and impacts. With a half day designated for such training, we debriefed a bit on the goals that were set for the big event and talked about the mechanics of banking and supporting the exercise on the floor. We would involve them in the full debriefing during the large event. This design gives me the ability to put my executive coaching hat on, debriefing them with the goal of improving the senior leadership teamwork with real purpose. It also enables me to run really large groups with only ME being required for delivery. You can imagine how that positively impacts my profitability, decreases client costs and minimizes any staffing issues. We also have plenty of management help for running the game itself, an involved and committed leadership group aligned to a shared goal and purpose. I can also charge the client a LOT less than my competitors because we are not charging for extra staff and travel expenses and all that. AND my delivery staff has that vested interest in making the event optimally successful. Imagine the staffing needs to run a typical experiential exercise for 300 people versus the ability to deliver a senior manager team building session plus the large teambuilding event with only my active involvement and participation. Simplicity and effectiveness! We generate a much higher likelihood of behavioral change and implementation of organizational improvement after the event, since the managers have a really powerful hands on collaborative experience in working with each other to maximize the results of the event itself. The debriefing of that senior manager session focusing on discussing the kinds of behaviors these senior managers would like to see from the people at the large event helps tie things together. The focus on the shared missions and visions and the generation of alignment to goals, objectives and expectations becomes quite clear. Having these real Senior Managers in this game delivery role is a great leadership learning lesson on how to implement change and support high performance. One cannot simply TALK about what leaders and players should be doing; they have to behave consistently and congruently to actually generate results. And behaviors of the teams playing the game directly parallel what we see in organizations. While a few of the tabletop teams will have precisely what they need to perform at a maximum level, those same teams will often choose NOT to collaborate, to thus “win” the game at the cost of negatively impacting overall organizational results. This is one of the great debriefing points — that collaboration is a desired overall organizational outcome! I hope that this framework has been informative and helpful. We sell the Dutchman game directly to end users looking for a high-impact, low cost training tool. We deliver the game to companies wanting outside facilitation. And, we rent the game for one-time use. Have some FUN out there! Since we started focusing on the rental of our large event team building simulation, The Search for The Lost Dutchman’s Gold Mine, I have been engaged with consultant trainers asking me more questions about impacting organizational effectiveness and engaging senior managers in strategy improvement and change.Dutchman is one of the truly great team building exercises that works well with really large groups. Generating real organizational change is always an issue – how does one generate real involvement and alignment and ownership among the senior management team? And how does one really get value and focus from a large group event? We think it is active involvement and engagement along with clear discussions about past and future choices for changes and behaviors. In actuality, delivering a large group event using the simulation represents an unparalleled opportunity to really accomplish executive team building and alignment because of a specific design feature in Dutchman: its’ direct simplicity. The end result after 20+ years of polishing was a very straightforward team building program where there are few hidden tricks and a complete congruence of all of the facilitation staff to support the players in solving the challenges that are presented. The banking of the game and the tracking of team behaviors was made really simple. There were few “mechanical” issues and it was easy to learn how to operate so that a facilitator could pay more attention to the observed behaviors rather than needing to become some expert on game mechanics. And the result exceeded expectations; in actuality. FEW people ever call me after purchasing the exercise and going through the instructional materials. Few people ever contact me after they deliver the game with questions and only occasionally do we get into nuanced discussions about design and tweeking the game to focus on details. It’s simplicity became a feature and benefit! When I first started my deliveries, I would assemble some outsiders and pay them to help me deliver large games (50 people or more). And as I was asked to deliver even larger programs, I would often get internal people together for an hour or so to teach them the mechanics — these were often the training or HR staff who were supporting the event. What I eventually discovered is that I could deliver an actual team building session for a group of senior managers, running them through the actual exercise with a normal debriefing of results and impacts. If I could get them to commit to a full day, I could also get their agreement on alignment and shared goals for the organization, link that to the desired debriefing of the results of their large group team building event, and then put them into an active role for that delivery. Some could be “bankers” and some could help as coaches on the floor answering questions and providing direct team support. This design gave me the ability to put my coaching hat on with a real purpose and also enables me to run really large groups with only ME being required for delivery. You can imagine how that positively impacts my profitability and minimizes any staffing issues and we also have plenty of management help for running the game. I can also charge the client a LOT less than my competitors because we are not charging for extra staff and travel expenses and all that. AND my delivery staff has a vested interest in making the event optimally successful. Plus, we generate a much higher likelihood of behavioral change and implementation after the event, since the managers have a really powerful hands on collaborative experience in working with each other to maximize the results of the event itself. The debriefing of that senior manager session focuses on discussing the kinds of behaviors these senior managers would like to see from the people at the large event. A focus on the shared mission / vision and generating alignment to goals, objectives and expectations becomes quite clear. Anyway, it is really neat to see these kinds of large events happening, since they can be powerful events to engage people in change and improvement and to lead them out of the current “engagement doldrums” that we seem to find ourselves. I first published The Search for The Lost Dutchman’s Gold Mine back in 1992 and we ran a lot of sessionss to perfect the exercise and polish the materials. You can read a press release about it’s 25 years here. Not long after that, I started selling versions of the game to consultants all over the world. By now, we are pretty well represented with play in most regions and even collaborating with SimuRise Learning Solution‘s Solomon Salvis in Singapore who is handling global distribution with us. In April, 2013, I got a note from David Simpson responding to some of my instructional delivery notes that said no group had actually delivered A Perfect Play as shown in my debriefing powerpoint files. In that, I construct what the optimal play of the exercise would be for one team (that happens a good bit) and for a group of three teams collaborating together. To my knowledge, it had never happened. Something had always occurred to prevent a team from doing everything correctly. Well, David announced to me that one group of three teams for Couch, running the game in Shenzen, China, was able to collaborate with each other as well as collaborating with The Expedition Leader to generate an optimal outcome. And, he had them so excited that he asked if I might generate an Official Certificate of Accomplishment for their efforts. Guess we gotta go with the flow and get that done. So, I spent a bit of time and put this together. There are just so many possibilities to generate intrinsic rewards from accomplishments that it still amazes me that managers do not do more of that. We can engage them by asking what things need to be improved or fixed. We can dis-un-engage them by asking them what blocks their involvement and what we should be dong about it. What is so hard about all that? Do you have any special ways in that you recognize high levels of performance over the long term? What kinds of things do you do that might sustain high performance and add to your effectiveness and team results? We’ve been selling the Lost Dutchman’s Gold Mine game for twenty years now and I continue to feel that this is the best program in the marketplace niche in which it appears. And it continues to surprise me that the exercise seems as fresh to me today as it did 10 years ago when the materials were fully developed, fine-tuned and polished. I guess I am also surprised that the opportunities for improving inter-organizational collaboration are still evident everywhere and corporate team building seems to continue to be an area of high leverage for impacting productivity. Companies should have made more progress than they have! We have active consultants working with corporate team issues, worldwide, and the opportunities for trainers and internal consultants to use this exercise and approach seems like an untapped opportunity. After all, don’t these internal people see an advantage to using a bombproof exercise that generates the precise competitive behaviors that need to be better blended with collaboration and engagement opportunities as well as the need for inter-organizational alignment? A recent conversation with an outdoor training organization in Asia resulted in a potential collaboration with that firm and networking them to three other global experiential training companies who have blended my programs into their other offerings. It seems like the collective idea of sharing and the learning about positioning team building simulations into the other kinds of corporate teamwork programs is a simple and straightforward one. I am glad that my network continues to be quite collaborative in sharing ideas for delivery and marketing. One aspect of delivering The Search for The Lost Dutchman’s Gold Mine for a large group is that you need three people to help operate the game for every ten tables (60 participants). The banking and the delivery are really straightforward, but they do require a review of rules and systems and optimal processes. And you can run lots of really large groups, cheap. You just need some helpers! I just finished a webcast for about 70 people who will be involved as Provisioners in the banking of 9 different sessions of between 140 and 290 college students, each. This is part of a professional honor society’s student development initiatives and they will be running Dutchman all over the US. Pretty neat. Almost 2000 students will go through this as part of their orientation to the accounting profession. So, I am volunteering a good bit of extra time to help them, with this webcast being but one of several coaching sessions for their supporting volunteers. As of yesterday, I now have a much more refined and detailed powerpoint training program for Provisioner (banking) Training. Any of you that own the game would probably find it useful, since it reviews ALL of the key parts of the support activity and might point out something you either missed or did not quite understand about the delivery. The powerpoint of The Search for The Lost Dutchman’s Gold Mine is done for this part of the training, if you want to take a look at it.Click on the link and I can email it to you if your game needs updating. You can find a complete overview of the key aspects of Dutchman in another blog post that has a connection to our slideshare program describing the exercise. Dutchman is one of the premier team building exercises in the world, especially when used for very large group presentations. Highly interactive, and focused on collaboration and strategic planning, leadership, motivation and teamwork. The situation is to design a company team building program for 50 directors and above who operate globally. Grown through innovation and acquisition, the various operations within the business all work well individually, but collaboration and synergy could be improved across the organization. The opportunities around a fun, interactive team building exercise focused on optimizing overall business results is high, and this event can be used to lead off their entire business conference. One Goal is to produce the best overall results that we can for the success of the entire organization and not just one group or team. Another goal is to generate alignment and collaboration throughout the organization. The issues are around improving planning and collaboration to drive a better overall result, one that could be linked to a variety of organizational alignment and communications issues and help the organization improve its customer service. Please note that a sister article to this, entitled, “Maximizing team building impacts with Senior Managers,” can be found be found by clicking on the title. This client wanted to bring people from all its global operations to Dallas. These included locations in Europe and Asia so having a business simulation that worked well with these cultures was important. We have associates running the game throughout these regions and I know from my personal facilitation efforts that the different cultures tend to make similar decisions and play with a similar level of competition versus collaboration. For the most part, my debriefings differ more between different kinds of organizations more than different cultural perspectives or levels of management. This program was a multi-day event, with the overall desired outcomes focused on generating real collaboration between the operating entities, as demanded by the increased global competition they faced — they needed to improve innovation and customer service across global lines. The metaphors in Lost Dutchman link beautifully to themes of planning versus executing, competing versus collaboration, intrinsic versus extrinsic motivation and other aspects of organizational alignment and communications. Thus, it can be tied metaphorically to many of the overall goals and tactics of the program design group. And that was what we did. The Group President took an active role in the game play and debriefing. My very favorite way to do this is to help the leader facilitate a discussion of, “What does Mining Gold mean to our organization” and we allowed the 10 different tabletops to first engage themselves and then to share their business improvement ideas with the entire group. This set up some very distinct actionable outcomes for the rest of the program. We set the tabletops with the straw cowboy hats and colored bandannas as part of the “paraphernalia” and the get-ready to play aspect of the exercise. It helped to energize the group for fun. Nearly every one of them kept both the hat and bandana and that will be an ongoing kinesthetic and visual reminder of the activity and the discussions. Options: One of the things I would have liked to have done is this: At the end of the play and the conclusion of the debriefing, we have a fun “awards ceremony” and give each of these senior managers a nice, white, crushable felt cowboy hat to take home to display in their office. These white hats are awarded as a symbolic activity, with the most senior managers giving a hat to each of their direct reports and cascading these awards down through their line operations. The idea is to celebrate the success and to reward the good ideas for things that could be done differently. There might also be a “cowboy hat dinner event” at the end of the conference to celebrate the changes and new ideas that they will choose to implement after their departure. At this point the event planning has not been completed. Change and strategy implementation is difficult to accomplish and having something visible and tangible is often really helpful. I think of the “White Hat Award” that Western Electric used to give to a couple of their managers from the thousands in their organization — to use the word “coveted” does not even come close to how much those were valued by the most respected and accomplished senior managers. They were proudly displayed in their offices when I was consulting with that organization long ago. They were a point of pride. What we did do was completely engage all of the participants in discussions about current issues and very specific improvement opportunities. We allowed them to make choices about what to do differently to improve operational results and impacts. It is obvious that the costs of a program of this kind, with hotel and airfare and the other related activities, is quite high. Thus, senior management should be looking for tangible issues and real opportunities to impact their business and improve operational results. It is clear from our years of supporting the exercise for change management and strategy implementation that a wide variety of issues will rise up for discussion in the debriefing and subsequent conversations around the play, and that ideas for improvement will be a natural result of participation. Thus, a company should be prepared to document and plan tactics for addressing them. Normal business operational tactics are often optimal because they fit smoothly within business operational practices. Changes in expectations, feedback and measurement systems are often used to drive the strategies. But companies can also use effective tools within that roll-out program. One of the roll-out activities could easily be Lost Dutchman, done at each location for those management teams, since it would be easy to learn to facilitate after one played the game. It is our experience that anyone who went through a delivery of the Lost Dutchman exercise would be somewhat capable of delivering that exercise in the future. PMC could support those global organizations with trained consultants to help them run the game locally in their organizations or we could supply various training people with Dutchman games so that they could run them locally to cascade these ideas about collaboration and optimization of results in each of the workplaces. The guys with the White Hats should be a visible part of the facilitation and leadership team pushing for improved workplace engagement and collaboration in their organizations. At this point, we are prepared to help the client organization identify its potential issues and opportunities and define some strategies and tactics that would be helpful for roll-out and implementation. Improving the interpersonal relationships of the senior management team will be helpful to improve overall collaboration. But there will be some structural changes that will need to be done to insure that these good ideas become institutionalized best practices. Please note that a sister article to this, entitled, “Maximizing team building impacts with Senior Managers,” can be found by clicking on the title. Dutchman is delivered as a team building exercise and debriefed on the basic principles of improving interdepartmental collaboration and generating opportunities for improvement. There are strong ties to leadership, engagement and communications. For management development, it is a superb situation to engage participants on issues of optimization, motivation and performance. As a team development exercise, it is used by an impressive list of multinational organizations and international consultants and trainers. The main theme, Mining as Much Gold as We Can, is generally linked to the celebrations of past successes and new ideas for teamwork and collaboration within the organization. In addition, debriefing discussions can focus on the future impacts of teams contributing their individual results to the overall outcomes for achieving goals. The exercise is designed to take 3 to 3.5 hours to play and debrief thoroughly. It has tabletop teams sharing best practices and information about the game to help other tabletops be more successful. Everyone succeeds but teams that collaborate and plan succeed more than the others. This tends to mirror the collaboration opportunities of most organizations and is a valuable learning lesson from play to link to issues of change. This highly interactive board game team building exercise was initially developed by Dr. Scott Simmerman, in 1993 and is being used worldwide by a wide variety of multinational corporations, government agencies, consultants and various other organizations. The main PMC website shares a detailed client list and links to individuals who have agreed to offer their testimonial support. Technical and scientific users of the exercise include Microsoft, Fluor, Institute of Nuclear Power (INPO), Infineon Technologies, Ingersoll Rand, GlaxoWelcome, Michelin, Nokia, Lucas Technologies, Nortel Networks, Sony, Dupont, Intel, Pacific Gas & Electric, PayPal and others. Government users include the Census Bureau, Air Force Intelligence Command, HUD and many others. Sold since 1993, we have a long and very extensive list of clients and active users and Scott has delivered Dutchman programs to companies and organizations in 38 countries. And while there are a few other games of a somewhat similar nature, testimonials from active users of the exercise suggest that we have an incredibly effective tool for generating active engagement and discussion of individual and team choices when it comes to improving performance results. As background, Scott is Managing Partner of Performance Management Company, a Taylors, SC company in the training and consulting business since 1984. He holds a doctorate in psychology from the University of North Carolina at Chapel Hill and has a great deal of experience in delivering this exercise in all sorts of situations and with differing desired outcomes. Scott is a Certified Professional Facilitator and writes extensively on organizational improvement and people and performance themes. Managers do not often deal with good performers in effective ways. Relying on extrinsic rewards is often a formula for completely missing the real underlying motivation of many high performers. Extrinsic reward systems are often problematic and cause more problems amongst the bottom 70% (who never win and are thus losers) or generate behaviors that are not congruent with missions and visions of the organization. I chat about that in a lot of my blog posts, most recently this one. There are a lot of posts on extrinsic motivation here. The Search for The Lost Dutchman’s Gold Mine is a team building exercise that is a bit unusual in that it focuses on the collaboration between tabletops to optimize the measured results. It is only partly about winning — it is more about what the higher-performing teams could have done differently to support the lower performing teams to optimize overall results. The goal is, “To Mine as Much Gold as We Can” and to optimize the Expedition Leader’s return on investment. Obviously, the more ALL the teams perform, the better the overall results. It also tends to generate a My Team, My Team, My Team kind of response in so many cultures that tend to reinforce competitiveness as a basic operational strategy — something that tends to make the words “Interdepartmental Collaboration” an oxymoron in so many companies. The reality is that more collaboration will most certainly improve organizational results, engagement, service, cost reduction, innovation, etc. A “My Team, My Team, My Team” focus can cause more competition than collaboration. The goal is to optimize organizational results, not win! In Dutchman, teams can spend an extra day gaining information that enables them to optimize their results. One metaphor is a strategic planning one that allows them to re-allocate resources to have a better likelihood of success. The other is a Best Practice, one that enables them to move faster. It also gives them things to share with other teams – Turbochargers that double the speed of movement. We’ve been supporting a network of consultant users and trainers since 1993 and have received most excellent feedback. As I note in another blog, we recently had the first Perfect Play that I have heard of. Some groups or triads within larger groups come close, but none got it perfect until David Simpson’s group of three teams with the retailer Coach. Now, the issue is optimizing post-game impacts and generating increased collaboration among the store managers now back at work. Perfect Play has its own results summary powerpoint show. They reach the Mine on Day 8, using up all their resources and returning on the last day possible, Day 20. The summary of results and resource use looks as follows and they had a surplus of $50 worth of stuff as well as two Turbochargers that they could have shared with two other teams (if they chose to). That sharing would have generated six more days of mining if all things were good. Instead of one team mining 9 gold, this framework allows for two teams to mine 10 and that extra team to mine ELEVEN. This has only occurred in David’s game. And it makes for a great debriefing, in that a lot of the right organizational optimization behaviors have occurred in play, the teams managed things in a relatively stress-free mode (with no fear of real failure) and it carries over very neatly into the discussions of what they could choose to do differently. And that very last part needs special mention. To get a Perfect Play, the three teams need to ask for $50 from the Expedition Leader! I mean, is that a perfect design or what?!! And, my new game will focus even more attention on post-game collaboration and organizational improvement. You can see a few of the game design ideas here.